As Taiwan Apple Daily goes up for sale, this has aroused the fear of flat media. At 6pm on 20 November, 2012, Hong Kong Apple Union wore black T-shirts and shouted “I want Apple (a newspaper), Don’t want black hand" at the newspaper’s building. 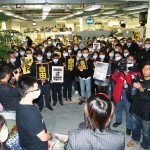 More than 100 colleagues participated and shouted “Support Taiwan Apple Daily".